Stems: Stems absent or essentially so. Plants coarse, pubescent, gray-green. Leaves: Basal; petioles often reddish at base; blades oblanceolate to elliptic, 1.8 to 8.6 inches long, .4 to 1.6 inch wide, margins entire or remotely dentate, tip acute. 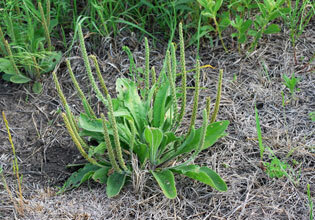 Inflorescences: Terminal spikes, long-cylindric, .8 to 8 inches; bracts lanceolate to linear, 0.8 to 1.2 times as long as calyx; peduncles appressed-pubescent or hairs loosely ascending. Flowers: Calyx 4-lobed, lobes ovate-lanceolate, 1/10 to 1/7 inch, margins broadly membranous, somewhat translucent; corolla semi-transparent but sometimes appearing white, tubular, 4-lobed, lobes 1/12 to 1/8 inch, erect, forming beak over capsule; stamens 4. Fruits: Capsules ovoid, .2 to .28 inch; seeds 2, dark red, ovate to narrowly ovate, 1/12 to 1/8 inch. Comments: Plantago, sole of the foot + to put forth or extend, alluding to the shape and orientation of leaves of Plantago major, and rhodosperma, red + seed.